Independent Commission Against Corruption (ICAC) Commissioner Megan Latham is refusing to answer questions regarding alleged corrupt conduct by herself and ICAC. Ms Latham and ICAC have covered up judicial bribery which includes a $2.2 million bribe by the Mafia as reported last week by Fairfax Media and the ABC’s Four Corners program. 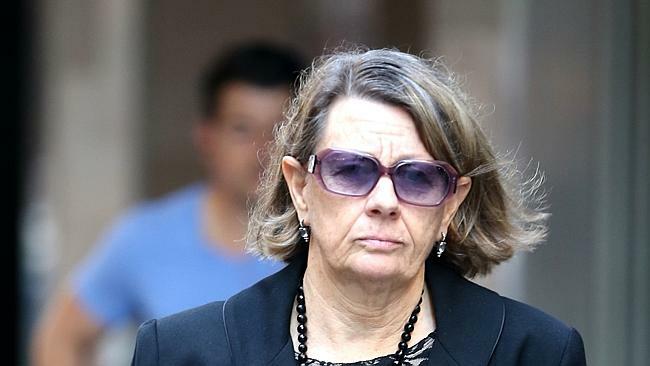 Megan Latham, who is a former NSW Supreme Court and District Court Judge, has refused to investigate numerous allegations of judicial bribery in NSW. Ms Latham and ICAC have also failed to have someone from interstate investigate the alleged judicial corruption. Protocol and precedent say that an interstate person should have been brought in for the investigation given Megan Latham is an ex judge and would know many of the judges that would be investigated. It must be noted that it is highly likely that at this stage Megan Latham would be a possible suspect as well. The issues in this article are not complex. Megan Latham and ICAC have an obligation to investigate when public servants like judges take bribes. There have been mainstream articles saying that NSW judges took bribes totalling $2.2 million. If the Mafia bribed NSW judges $2.2 million in one matter how much is the total amount that NSW judges are taking in bribes per year? $10 Million? $20 Million? $100 Million? There is a powerful prima facie case to have Megan Latham charged with the criminal offences of attempting to pervert the course of justice and concealment of a serious indictable offence. I wrote to ICAC and Megan Latham asking questions for this article and the reply as per below was that my working title was defamatory and they would not answer the questions. That is a stock standard type of reply for people who are caught out acting corruptly and have no answers to justify their actions. ICAC are well aware that the mafia bribed NSW judges $2.2 million which I wrote about last week in a post titled “Top secret police report says Mafia bribed NSW judges $2.2m. Some corrupt judges named“. (Click here to read) Yet ICAC have done nothing and refuse to answer questions about it. Why? The Hon Megan Latham is the current Commissioner of the Independent Commission Against Corruption. She was appointed for a statutory five-year term in January 2014. Ms Latham was a judge of the Supreme Court of New South Wales from 2005 to January 2014. From 1998 to 2005 she was a judge of the District Court of New South Wales. From November 1999 until October 2002 she was the part-time Deputy President of the Administrative Decisions Tribunal and Head of the Equal Opportunity Division of that tribunal. Not only was Megan Latham a judge of the NSW Supreme Court and District Court but she also worked as a Crown Prosecutor with Margaret Cunneen. This is important as ICAC and Megan Latham have recommended criminal charges against Cunneen and they wanted someone from interstate to deal with it at ICAC and the DPP as there is a perceived bias issue. It is standard practice that when allegations of criminal conduct are made against a judge or other well-known people in the legal fraternity that a judge or prosecutor from interstate is brought in for the investigation or court case. ICAC and Megan Latham are well aware of this. Last year when they were going to have public hearings into alleged corruption by Crown Prosecutor Margaret Cunneen they had arranged for someone from interstate to act as Commissioner and hear the matter. That is because Latham and Cunneen had worked together in the 1980’s and early 1990’s at the DPP office as prosecutors. This did not eventuate because of the High Court challenge and loss. The reason ICAC said “independent person from outside NSW to undertake that task” is because there is instant perceived bias if Cunneen’s friends and fellow employees at the DPP were to investigate her. But somehow ICAC and Megan Latham think it is OK for Latham to oversee an investigation into her former work mates in the NSW Judiciary. The reality is they know it is not OK and that is why they are refusing to answer any of my questions. Did Megan Latham take bribes when she was a judge? I put numerous questions to Megan Latham on Wednesday including asking if she took bribes when she was a judge. She refused to give a direct answer. Given that Latham is a possible suspect how could ICAC investigate Megan Latham. They couldn’t and to suggest they could would be scandalous. It clearly needs someone from interstate to investigate the $2.2 million bribe which they are currently covering up. On Tuesday the 14th July 2015 I received a decision letter from Nechal Dhillon at ICAC which swept my complaint under the carpet. (Click here to read the letter) They ignored almost all of my evidence which is standard for a cover-up but like most criminals they were stupid and shot themselves in the foot because they had an obligation to get someone from interstate to investigate my complaint which they did not. The fact that ICAC and Megan Latham did not get someone from interstate sends the alarm bells ringing that it was a cover-up for her friends. If it was not a cover-up why has Latham and ICAC breached their own policy and precedents so blatantly. Not only in my compliant but also the $2.2 million Mafia bribe. I am writing a story with the working title “ICAC Commissioner Megan Latham covers up judicial bribery by the Mafia and others. How much has Latham been bribed?” and I have a few questions. I spoke to ICAC employee Nechal Dhillon and she said it was fine for me to write a story about Megan Latham being corrupt. In fact Ms Dhillon encouraged it. In the last week Fairfax Media and the ABC’s Four Corners program have said that the Police reports say that the Mafia have bribed NSW judges $2.2million. Why has ICAC and Megan Latham failed to investigate the Mafia bribing NSW Judges? Is it because a lot of the judges are Megan Latham’s friends? Was Megan Latham a recipient of part of the $2.2million bribe? I made a compliant to ICAC regarding numerous judges acting corruptly. When I spoke to Nechal Dhillon yesterday she made it very clear that ICAC were going to sweep the compliant under the carpet and do nothing. Ms Dhillon did not hesitate to lie, deceive, duck and weave on the phone. She clearly had Megan Latham’s authority to do this. Why has Megan Latham sent word down the line to cover-up the judicial bribery complaint by me? When Megan Latham was working as a judge of the District Court from 1998 to 2005 and Supreme Court judge from 2005 onwards was she ever offered a bribe? Has Megan Latham ever accepted a bribe? My complaint raises conduct by the following judicial officers, alleges judicial bribery and has documented evidence: Justice Ian Harrison, Justice Lucy McCallum, Justice Peter Hall, Justice Michael Adams, Acting Justice Henric Nicholas (now retired), Justice Clifton Hoeben, Acting Justice Robert Hulme, Justice David Davies, Justice Peter Garling, Justice Stephen Campbell and Chief Justice Tom Bathurst. Can you please identify which of the listed judges Megan Latham knows personally? For the judges that Megan Latham identifies that she knows personally can Ms Latham please advise how well she knows them personally? E.g. Does she socialize with them and how often etc. Given there is a conflict of interest when taking into account Megan Latham’s judicial position as a judge of the Supreme Court of NSW and at least a very powerful perception of bias (if not real bias). The Cunneen hearing I understand was to have an interstate barrister/judge acting as Commissioner but the hearing was cancelled given the High Court judgment. Why has my compliant not been dealt with from someone interstate as ICAC were going to do with Margaret Cunneen’s hearing? As it currently stands ICAC and Commissioner Megan Latham have acted a lot more corruptly than Margaret Cunneen has been accused of. Will Megan Latham be resigning? It would be greatly appreciated if the questions could be answered ASAP as I will possibly have follow-up questions. The working title of your story is defamatory, and we have no comment to make in relation to the questions you have asked. While Megan Latham might not have liked my questions she cannot avoid them forever. The public have a right to know. ICAC have done some very good work over the last couple of years and I have supported it but it is not above the law. Now I am investigating ICAC, Megan Latham and writing about their corruption which is a bit sad (given their recent good work) but it needs to be done. This post is only the first of many I suspect I will end up publishing on Megan Latham. Her position is clearly untenable and she has to be sacked or resign. Please help promote this post by using the Twitter, Facebook and email etc. buttons below. You can follow this website by free email notification at the top right of this page and about twice a week you will be notified when there is a new article published. What can anyone with a logical mind make of all of this, the answer to that question is simple, where there is smoke there is FIRE .. !! New South Wales has always been the HUB (if you will) for Corruption within Australia, stemming from it’s days as a British Colony and the dubious beginning from the days of the Rum Corp..!! The feeling that I am getting as I continue reading these articles, is that the ‘Old Guard” knows their days are numbered and that they are going to hold on for grim death to the bitter end, while the Anti Corruption Sentiment within Australia and that is now becoming a Global Cry gets even louder.. !! I’ve said it before and I will say it again, if they have nothing to hide, then they should have nothing to worry about with an Inquiry, staving off any Inquiry, just raises the suspicion that this is Bigger and Deeper.. !! One has to question the intelligence of some of these people, the longer this goes on, the worse it will be for them when it finally all comes out and history tells us that it always does at the end of the day.. !! One only needs to do some Google research on Icac NSW to see how corrupt and useless they have been in the past. I agree Icac has got a little better in the past few years probably because of public pressure but no doubt Icac is still corrupt. The people who want a federal Icac don’t want it based on the this Corrupt NSW model. Great post. Send in the Clean Out I say! The $2.2 mil bribe is just the tip of the iceberg. Please don’t throw out the baby with the bathwater!– Use some common sense! Is Megan related to Mark? “Ms Latham and ICAC have covered up judicial bribery ” How far is this removed from a treasonous act towards one’s country? How about an update on Margaret Cuneen now that the courts have thrown out Latham’s “Evidence” of her coaching her daughter after the accident? Regardless of how dirty Cuneen is, what was the real reason do you think that Latham was after her? Did she get a bigger kickback from someone than her? Cuneen is suggesting her daughter and the boyfriend may sue ICAC. I’m sure she has enough legal friends that would gladly go after Latham pro bono.